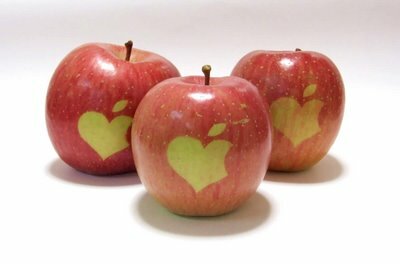 These branded apples have got a heart on for you! 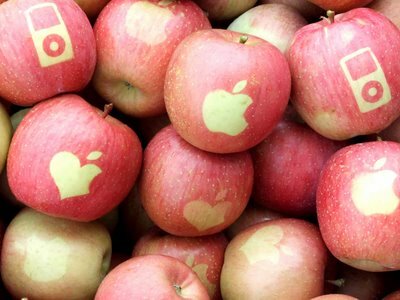 Get a load of these apples! Blog!NOBON is much like any other Apple Computer fan site, except for the fact that the owner makes his own Apple apples. That is, he grows apples that proudly carry the familiar Apple logo and variations thereof, right on their peels. 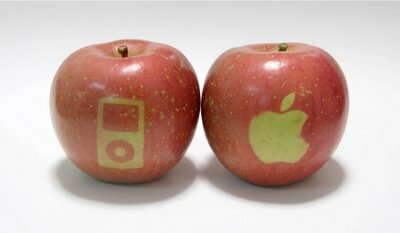 No painting, no photoshopping, no trickery of any kind is used to create these distinctively marked apples - unless you're an apple, in which case the trick's being played on you! Blog!NOBON has designed a series of sticker templates that feature the familiar Apple Computer logo, a variation with a bitten-into heart, and a stylized iPod. A month or so before the apples in his backyard orchard ripen and turn red, he sticks the stickers on the apples - thus preventing sunlight from activating the pigment cells in the apple peels. At harvest time, he removes the stickers to reveal pale green logos against the rosy red apple peels. Not quite the Macintosh memory you were thinking of, and these apples have but a single core! This type of "directed growth", for want of a better phrase, is relatively common in Japan. Watermelons are available in square and head-shaped styles and cucumbers are coaxed into shapes that are heart-shaped in cross section: perfect for slicing.